I’m very excited to have my first guest blogger Annie from Backwoods Housewife. She knows a lot about saving money and living on a budget. I asked her to share some of her secrets with my readers. Follow her on Twitter and also subscribe to her blog, for more money saving ideas. Thank you Annie for this great post, perfect timing too since I need to grocery shop this week! Annie Sullivan blogs at the Backwoods Housewife about being a housewife and a mother of six. Besides writing about grocery shopping on a shoestring budget, she also writes about cooking, home organization, and living on a soon-to-be working farm. Grocery shopping on a budget can be difficult. Buying healthier foods is challenging in today’s economy, but at the same time, it’s important to our family’s long term health. It’s especially important if you have young children, as the eating habits they form when they are young will often stay with them throughout their entire lives. Here are 10 quick tips for grocery shopping on a budget. Use coupons-but only for products that you would buy, and that you feel fit into your definition of “healthy.” For my family, that doesn’t mean organic right now-but it does mean avoiding packaged and prepared food as much as possible. I can make my own spaghetti sauce using canned tomatoes and tomato sauce-which contain far fewer additives that a jar of spaghetti sauce. Plus, I can hide vegetables and fiber in the home made sauce. Cut down on your meat portions. According to the health.gov website (http://www.health.gov/dietaryguidelines/dga2000/usingdietguide.pdf), you only need 2-3 oz of meat per serving, with two servings per day. My meat eating husband would disagree with that, but I still try to cut down on portions. We do a lot of soups and casseroles this time of year, and I often cut the meat portion of the recipe by half. Meats make up the bulk of many family’s grocery budget, and by cutting your portion sizes, you will cut the amount of money you spend on meat. Think outside of the box. Avoid pre-prepared meals whenever possible. I can make three meals’ worth of home made spaghetti sauce for the same price as one meals’ worth of prepared sauce. Rice-A-Roni has been a favorite in our home, but by using spices and herbs, and adding either fresh or frozen vegetables, I can get the same results for less, even when I buy them on sale. Equip your kitchen. Buying a chest freezer, even a small one, means that you can stock up on meat when it’s on sale. You can freeze or can vegetables when they go on sale; a pressure canner can be found at most discount stores in mid summer to early fall, or you can order them year round online. A bread machine makes it easy for you to bake your own bread, even if you work and can’t be home for the kneading and rising. A family of four would pay for a large chest freezer within a year by buying meat on sale. Use your leftovers efficiently. When I roast a whole chicken, I use the carcass to make chicken broth, that I can then use for a soup, as a flavoring for rice or potatoes, or for any other recipe that calls for broth. When I cook a beef roast, I’ll save the leftover meat for sandwiches or to go into soup, stroganoff, or a casserole. Cook in bulk. 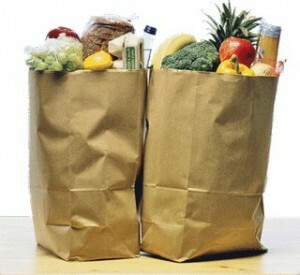 Un-budgeted purchases for food or take out often come when you’re too tired or too busy to cook. If you make lasagna, make an extra pan and freeze it. I cook five pounds of ground beef for burrito filling every few months. Then all I need to add are beans and tortillas or chips for quick burritos or taco salad. Buy in bulk-when it’s cheaper. Buying at Sam’s Club or Costco may not always be cheaper, so check your prices before you stock up there. Health food stores are great resources for bulk rice, flour, and pantry items, and they are often cheaper, even when buying organic, because there’s no, or minimal, packaging. If you’re looking for organic non-perishables, check sites like Azure Standard, who carry a great variety of natural products, and have great sales (although watch shipping at sites like those; shipping charges can increase the cost). Buy locally, when you can. If you have a Farmer’s Market near you, take advantage of their usually lower prices. You’re not paying transportation or packaging costs, and you’re generally dealing directly with the producer, so there have been no markups by middle men. Buy seasonally, when you can. There are many places online where you can find calendars of when particular types of meats and produce are on sale. Plan to stock up and freeze or can these items at those times, so you’re not paying higher costs later in the year. Those beautiful organic tomatoes that you want to buy at your whole foods grocer in January were probably grown in a climate controlled greenhouse, increasing the cost to the producer, and, ultimately, to you. Buy as much as you can when it’s on sale. Even if you can only buy one meal’s extra meat this week, that’s one you won’t have to pay full price for, next week. Do it again next week with the money you saved, and soon you’ll be able to do it for two meals, and then three. It’s perfectly acceptable to start slow, and then build up. It can be frustrating when trying to shop on a small budget. I can tell you, I’ve been there. I feed my family of eight on an average of $125 per week. But these tips will definitely help you get started in the right direction! Minute® Ready to Serve Rice Makes Packing Lunch Easy! Thanks for the tips! I need to shop a bit wiser and cut my food costs.